Altenmarkt-Zauchensee is a community in the Pongau area of Salzburg in the central region of Salzburg province. 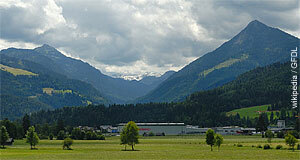 Even though Altenmarkt is a commercially successful municipality, it is mostly known as a holiday destination for skiing and hiking vacations. Altenmarkt is a member of the Salzburger Sportwelt union. Altenmarkt means "old market" and indeed, the history of this town can be tracked back very far: Even Roman maps indicate a significant settlement at the spot of modern Altenmarkt. Medieval Altenmarkt was first mentioned in a document in 1074. Archbishop Gebhart of Salzburg gave the community as a gift or some kind of endowment to the monastery of Admont. Throughout the middle ages, mining was the main industry in the region. In 1438, a house was built as accommodation for the miners of Altenmarkt. It was later transformed into a shelter for the aged in the community and re-named into Bruderhaus (brother house). It remained a home for the aged until 1970, when a modern building was erected for this purpose. The medieval house became the town museum, is now known as the Hoamathaus and among the major sightseeing attractions of Altenmarkt. However, sightseeing is not what most people want in Altenmarkt: Since the town offers direct access to one of Salzburg′s finest skiing areas, hitting the slopes is the main motivation for a trip to the Altenmarkt-Zauchensee skiing association.